Expansion arrangements: Provision must be made in pipe systems to accommodate changes in length due to change of temperature, and so prevent undue stress or distortion as pipes expand or contract. 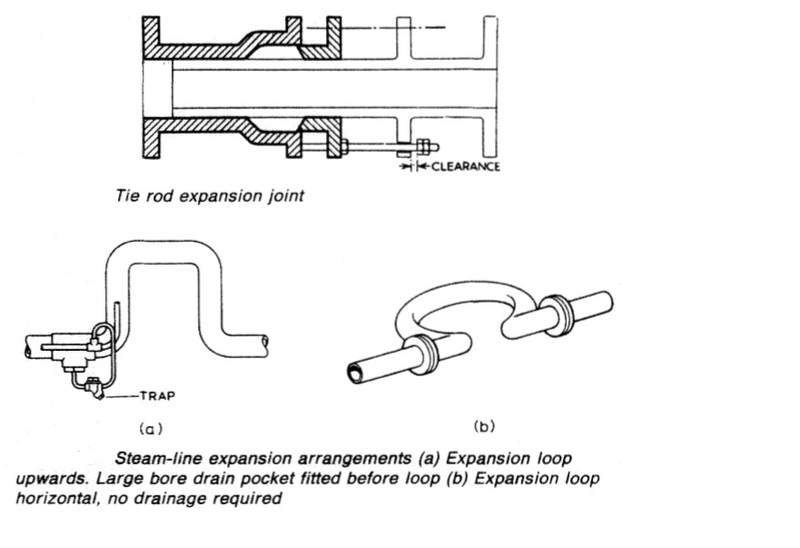 One type of expansion joint (Figure 3) has an anchored sleeve with a stuffing box and gland in which an extension of the joining pipe can slide freely within imposed limits. Simpler schemes (Figure 2a and 2b) allow for change of length with a right angle bend arrangement or a loop. For high pressures and temperatures with associated greater pipe diameter and thickness other methods may be more appropriate. Stainless steel bellows expansion joints (Figure 3) are commonly used since they will absorb some movement or vibration in several planes, eliminate maintenance, reduce friction and heat losses. Maximum and minimum working temperatures must be considered when choosing a bellows piece, which must be so installed that it is neither over-compressed nor over-extended. Its length must be correct for the temperature change. Stainless steel is the usual material for temperatures up to 500 deg C. Beyond that and for severe corrosive conditions, other materials are required. Normally the bellows has an internal sleeve, to give smooth flow, to act as a heat shield and to prevent erosion. If exposed to the possibility of external damage, it should have a cover. In usual marine applications, bellows joints are designed and fitted to accommodate straight-line axial movement only and the associated piping requires adequate anchors and guides to prevent misalignment. It will be apparent that, in certain cases, the end connections will act adequately as anchors and that well designed hangers will be effective guides. An axial bellows expansion joint can accommodate compression and extension, usually stated as plus or minus X mm, i.e. it will compress or extend X mm from the free length, at which it is supplied. It is most important that the unit be installed at its correct length as extension or compression outside its specified limits will cause premature fatigue. 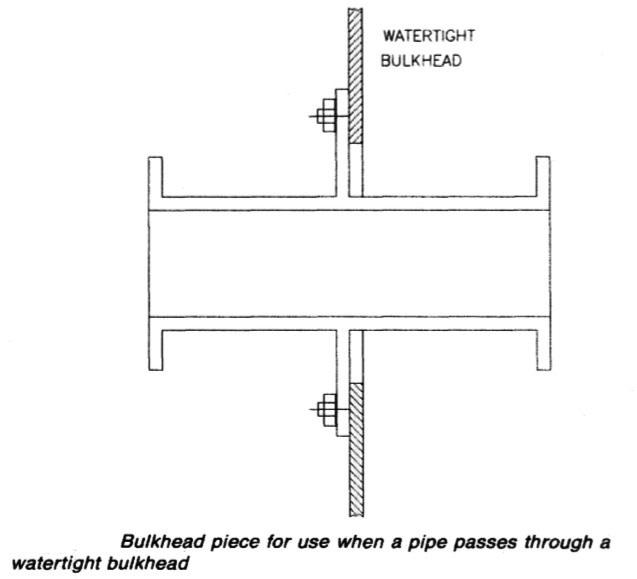 Pipes are carried through watertight bulkheads with the use of special fittings (Figure 4) to avoid impairment of their integrity. The large flange of the fitting, covers the necessary clearance in the bulkhead. Joints between flanges should be impervious to damage from the fluids carried and a variety of materials are available to suit the different requirements. Rubber for example, with or without cotton insertion, is suitable for water but not for oil. High pressure can force a joint out of a flange so that the thinnest joints are used for the highest pressures. Some jointing fabrics are sheathed with copper or stainless steel, which may be grooved finely and lightly in the area adjacent to the pipe bore. Most materials deteriorate with time and temperature so that periodic replacement may be necessary. Graphite compounds assist flexibility. Mating flanges should be parallel and accurately machined. Bolts should fit reasonably well and have good threads.